Welcome to Livermore's Big Apple Pizza !! 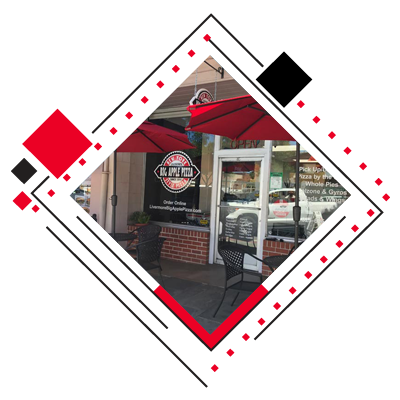 We offer one of the best New York Style Pizza in Livermore ! We are centrally located in downtown Livermore between 1st & 2nd street of Livermore. Here we serve you our fine fresh-made hand tossed New York Style Pizza with a thin crust, and pizza by the slice. What makes us unique than your average pizza place is, we have our traditional hand tossed pizza consisting of a light layer of our tomato sauce topped with our mozzarella cheese, and the choice of your fresh toppings. Our menu not only consists of yummy Pizzas but also have a variety of Calzones and Gyros, Brooklyn Cannolis, Salads and most important different types of Big apple Speciality and many more.We offer you a very convenient online ordering through our website. We also provide bookings, Takeaway’s, Deliveries, Group party bookings and much more.We take catering orders to celebrate your important occasions for which we also have wide range of items for catering orders.